I never felt there was a need to have a second season, but I have to assume that it scored so well with others that we had to cash in on the popularity. 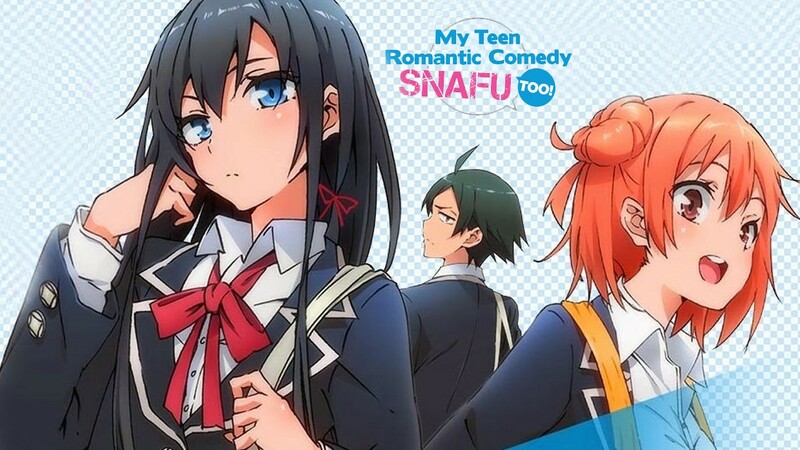 So, here we are with “My Teen Romantic Comedy SNAFU, Too” (”Yahari Ore no Seishun Rabu Kome wa Machigatteir”), subtitled “My Youth Romantic Comedy Is Wrong as Expected” and abbreviated as “Hamachi’ and “OreGairu”. Now, I always have the suspicion if you can’t agree on a title, there are bigger problems afoot. But this show has always been kind of like that. The show starts off in all-too-familiar territory, as Hachiman Hikigaya is still a Class-A grumpy slacker (in the middle, the Class-A grumpy slacker), but we see a kind of evolution as chinks appear in his armor, so the truth comes out. He seems to be getting pushed around by the other members of the Service Club, Yukino Yukinoshita (left) and Yui Yuigahama (right). It starts out with basic help for people with basic problems, but it is done is a rather ‘let’s get it done’ manner, just to get it done and not to resolve things properly.